In today’s fast paced world, time is an extremely essential commodity. We are always on the run. We are busy getting tasks done, we have places to go to and the battle between the clock and the things we need to get done seem to be a never-ending one. In such a scenario and over a period of time, our health is bound to suffer. With constant travelling we might not even get time to sit and enjoy a decent meal and thatleads to the onset of various lifestyle diseases. Breakfast is the most important meal of the deal and only if you start your day in a healthy way, will you be able to sustain and maintain your healthy life. The Breville JE98XL 850-Watt Juice Extractor is the perfect juicer for the super busy individuals. This juicer has some amazing features that reduce the time taken to extract juice drastically, which is a blessing for working professionals and busy parents alike. The Breville JE98XL is one of the top selling centrifugal juicers in the market today. Lets look at some of its features and find out why. Large chute: It has a large 3-inch chute, which requiresminimum or no chopping of any fruits or vegetables and this cuts down the time required to extract juice considerably. Maximum nutrients retained: Being a centrifugal juicer, it transfers very little heat during the extraction process and this ensures that the nutrients are not lost in the process but are retained in the juice. Powerful motor with 2 speed settings: It has a powerful 850-Watt motor with two speed settings. The lower speed setting of 6,500 RPM is for soft fruits and vegetables and the higher speed setting of 12,000 RPM is for hard fruits and vegetables. Easy to use and efficient: It has a patented direct central feed system, which not only makes extracting juice easy, but also quick and extremely efficient. Large juice jug: It has a juice jug with a capacity of 1 liter with a froth separator, which ensures no spilling, and no froth in your juice. Large pulp container: It has a large pulp container to make sure you can extract juice without a mess. Nutri Disc with filter: Its Nutri Disc with stainless steel blades and Italian made stainless steel micromesh filter basket helps in extracting juice, spinning out the pulp and gives you pulp free juice. Safety locking arm: The Safety Locking Arm prevents the operation of the juicer if the cover has not been locked properly, ensuring complete safety. Overload protection: You need not worry about the overheating of the juicer as the Breville JE98XL is automatically shut down if it is overloadedand it hasa LED to display the same. Power cord safety: The power cord can be wrapped, clipped and stored below the base to avoid cord trouble when in use. BPA free parts: Not only is the Breville JE98XL easy to use and easy to clean but also its parts are BPA free and hence safe to use. 1-year warranty: This amazing product also comes with a 1-year limited warranty. Cover is not dishwasher safe: Nearly all of the components of the juicer are dishwasher safe except for the cover, which is not dishwasher safe. Slightly noisy: The juicer can get a little noisy but not so much that it is a bother. Leaks sometimes: Some users have complained of leakages. Only 1-year warranty: Right now it comes only with a 1-year limited warranty. 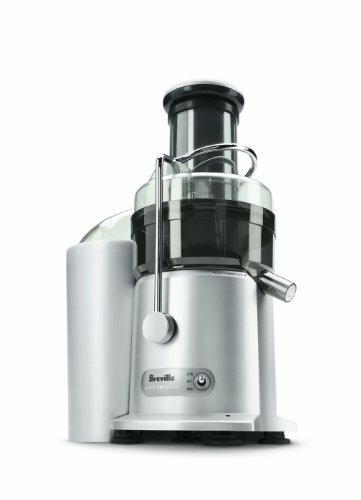 Semi-dry pulp: The Breville JE98XL, unlike a masticating juicer can sometimes leave a semi- dry pulp, which indicates that there might be still some juice left in the pulp. Due to this, its yield might be slightly less than that of a masticating juicer. Juice oxidizes quickly: The high RPM of the juicer due to its fast spinning disc allows more air to enter the juice, and hence due to the addition of oxygen, the juice oxidizes very quickly. This reduces the shelf life of the juice and it needs to be consumed immediately as it cannot be stored for a long time. Tough to juice greens: Since it is a centrifugal juicer, it can be a bit of struggle to extract juice from greens such as spinach, kale or wheatgrass. There are a wide variety of juicers available in the market today, which cater to each and every consumer as well as their budget. In this competitive market, there are a few features of the Breville JE98XL that make this juicer one of the most loved juicers. Let us take a look at some of the advantages that it has over its competitors. More efficient: The 850-Watt motor of the Breville JE98XL may seem less than some of the 1000-Watt motors that other juicers have. But what this juicer lacks in power, it makes up more than that in efficiency. Quick to use: One of its major advantages is that it quick to use. Being a centrifugal juicer, the time taken to extract juice and also clean up after you are done is very less compared to a masticating juicer. Minimum chopping required: With a large 3-inch chute, now you don’t need to chop fruits and vegetables into small pieces. In fact, for the small and soft fruits and vegetables, you can just put them in whole and enjoy your glass of fresh juice in no time. Large juice jug and pulp container: Its large juice jug and large pulp container makes sure that now you can make large batches of juice in the shortest amount of time and with the least possible hassle and mess. Easy to clean: If you think that cleaning and washing the parts of the juicer are the tough part then the Breville JE98XL has got that covered for you. Most of its parts are dishwasher safe except the cover. The stainless steel micromesh pulp filter comes with a cleaning brush, which is extremely useful to make your cleaning task easy. Durable: A large number of consumers who have been using the Breville JE98XL vouch for its durability; its construction and they continue to use it with a great deal of satisfaction even years after purchasing it. They also feel that it is more than worth the price they paid for it compared to the newer, pricier models of juicers available today. If you need a juicer that is gives you full value for your money, superlative performance and complete customer satisfaction then the Breville JE98XL is the one for you. It is the perfect kitchen companion for people who are busy but yet committed to live a healthy life by making healthy lifestyle choices. It will not only give you a fresh glass of juice but also due to its technology, it extracts juice without leaving out the nutrients. Its easy to use and quick to clean features have made it one of the most loved juicers and people who have bought the Breville JE98XL have felt that it is one of the wisest and best decisions they have made. Its 2 speed motor, the large chute which requires minimum or no preparation work of chopping the fruits and vegetables and its efficiency in extracting juice from soft as well as hard vegetables have earned it high reviews on all major websites. It also takes care of safety with its amazing safety features such as its safety locking arm and automatic shut off if the juicer is overloaded. With the Breville JE98XL there can never be an excuse for not looking after your own health as well as the health of your loved ones. It also makes a lovely and extremely valuable gifting option. What better to gift someone special than the gift of good health itself? If you are looking for a hassle free, lifelong, efficient and safe kitchen companion for life, then the Breville JE98XL is for you!